ABC Family/Freeform has released an extended synopsis and a ton of promotional photos for the twelfth episode of Shadowhunters titled “Malec,” which airs March 29. 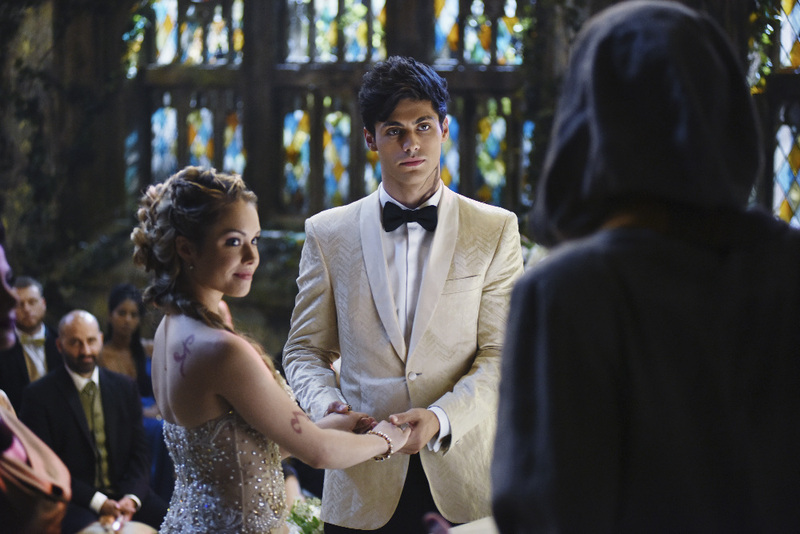 In “Malec,” relationships are being explored on the eve of Alec and Lydia’s wedding. SHADOW HUNTERS – “Malec” – On the eve of Alec and Lydia’s wedding relationships are being examined in “Malec,” an all-new episode of “Shadowhunters,” airing TUESDAY, MARCH 29 (9:00 – 10:00 p.m., EST) on Freeform, the new name for ABC Family. (Freeform/John Medland) HARRY SHUM JR.
No white hair or green skin and ridiculousy large horns that are supposed to be smaller and subtle. And now they can’t put in a line of “my sweet little peapod” for Magnus about Ragnor. That’s a bit depressing, but oh well…. Ragnor is looking a bit like Olaf from a Series of Unfortunate Events, well, plus horns. Magnus looks great. Hope Harry/Magnus is not sideline in favor of other in a ep with his M on it. The rest i could go without happily. Say what you will about Lydia’s character, but she does look beautiful in that dress. wasn’t white meant to be the color of mourning to the shadowhunters? please correct me if I’m wrong, but I thought they married in red or gold or something like that. I was thinking the very same thing! Not very happy about this development – they’re deviating from shadowhunter culture to conform with the normal image of wedding attire. Correct me if I’m wrong, but white is considered the color for mourning and funerals so why are the flower arrangements white in a wedding ceremony? Is it possible that during the wedding something will go horribly wrong and the wedding ceremony doesn’t finish? I hope so because otherwise we might have to wait for season two to see any real Malec, and as well season two might not happen. They are really throwing obstacles at Magus and Alec’s relationship and drawing it out! Just wishing for the best and a second season.